Mattison Gietman: "Absolutely stunning. Nour's work is a unique combination of his past, present, and future and is incredibly inspiring. Great work." Babak Kia:" I found exhibiting the universality of experience to be an inspiration. It is uncommon to pause to make the necessary associations in the busy modern life, to see them on exhibit is to be reminded of the continuity and freshness of a cool summer's breeze." Whitney Kelting, Ph.D:" I really enjoyed the show. I was struck throughout by the consistency of your explorations with gaze, directionality and the making personal of public spaces. The work on public/private notions of space (including the body) disrupted the sense that these barriers are impermeable. The integration of older black and white images (from Iran) with color images (mostly from Europe) challenges our perception about the impossibility of moving between these spaces. I particularly liked the piece, which blended the women's art studio with the slow shutter shot of the women on the street. The draftsmen like lines of the slow shutter shot beautifully evoke the gaze of the viewer without invoking voyeurism by linking it to the gaze of the artists working with a model. The image in the front with the artist who sketched the other artists rather than simply the male model suggests, especially when paired with the women on the street image, that the gaze may actually be female, that the evaluator of a woman's beauty or her success at being woman is in fact usual other women. I also loved the recognition of the beauty of women in hijab without the eroticism of the exotic veiled woman. Each piece bears individual examination while the show clearly coheres as a whole. Ed Mendelowitz, Ph.D:" There is a photo I have received as a gift from Naveed Nour of a Persian man who stands by his bicycle. The street scene behind is elemental, even pedestrian. Until one's sight drifts upward to a vaulted structure arching over all evoking expanse, mystery and a world beyond. And, somehow, this image seems of a piece with the photographer's Momento series currently on display at the New England School of Photography. In this collection, large photographs are split into two--and, in one instance, three--images more or less loosely connected in the artist's past and in his own mind: a fusion of moments, emotions, colors and worlds. It is the artist's personal narrative, no doubt, yet one which poignantly suggests a more universal truth in a world marked by change and dislocation and a shared sense among us that there is no clear direction home. In its aggregate, this is a series of haunting juxtaposition and contemplative beauty. 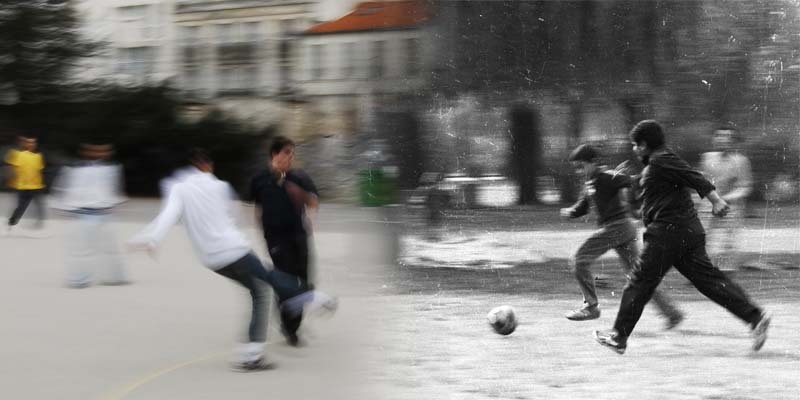 Images of time, separation and creative return. We are all, the philosopher Buber once mused, "creatures of the in-between." Naveed's photography is at once a testimony to this humanizing truth and a stilling of tensions as disparate worlds are reconciled and briefly restored, our own wandering souls momentarily healed in the experience of viewing. What more can one ask of art and the artist? David Crump:"I was pleasantly surprised at Naveed Nour's latest work: unique mashups of grainy, black-and-white photos and saturated color images. With fluid digital techniques he combines seemingly disparate people and situations into one unique work of art, challenging the viewer to reconcile this "temporal distortion" of people, places and ideas." 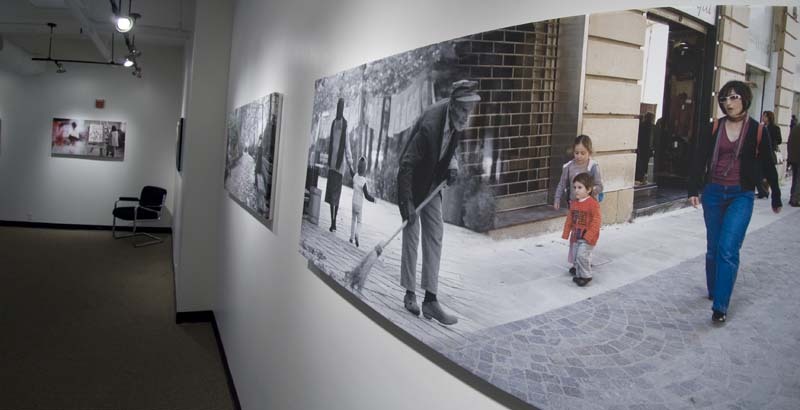 Hamra Abbas:"Naveed Nour’s exhibition of panoramic photomontages was a heart-warming experience on a bitterly cold Boston evening. Old photographic films exposed by Nour decades ago paired up with recent digital memoirs from his cross continent journeys, invites a sense of déjà vu and profound investigation." Alex Baltazar:"The work you exhibited at The NESOP was a wonderful mix of old and new, past and present, black and color; I loved the way the photography melded together seamlessly as if capturing a timeless moment. Like evolution caught in one frame. I really enjoyed your work and I look forward to seeing more of it. " John Martino, Ph.D:" Your approach to photography--to what constitutes a photograph--continues to evolve. "Momentos" is a fascinating collection of imagery, and one that fits nicely with your entire body of work. For me, each photograph has the initial effect of a cinematic dissolve, as my eye scans horizontally, from one image to the other. Step back, and both images freeze into focus: a near seamless juxtaposition bridging distinct moments of space-time as color and black & white bleed into one plane of reference. Sometimes the two images, despite the contrast of color and black & white, seem perfectly matched to form a single composite, magical tableau, like the image of street children playing near graves. Other times, something more akin to a split-screen effect emerges, and I am presented with a bifurcated world that projects a number of contrasts: between the past and the present, the old and the new, diversity and homogeneity, freedom and constraint, privilege and burden. To this end--and like all great works of art--these new images of yours charm both Eye and Mind." Yoav Horesh:" I was in Boston now for two days and I went over to Nesop to see your work. I liked it a lot! I think you made some really good references to world culture and interesting comments about clash of civilizations there, if I may say so."